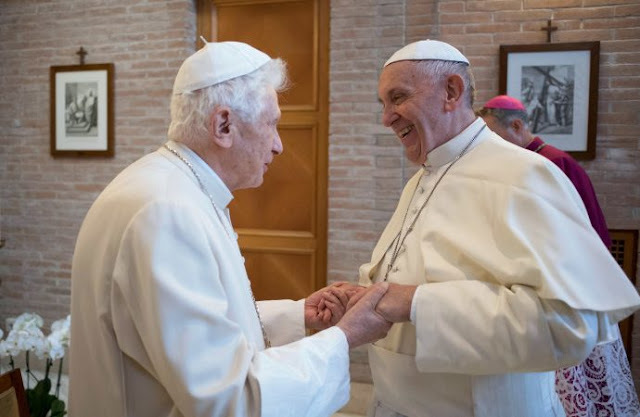 Pope Francis on March 27 visited the Vatican Secretariat of State and Emeritus Pope Benedict XVI to exchange Easter greetings with them. Pope Francis Tuesday afternoon met Pope Emeritus Benedict XVI at his Mater Ecclesiae Monastery residence in the Vatican and offered him best wishes for Easter, the Holy See’s Press Office said in a communique. Earlier Tuesday morning, the Pope visited the Vatican Secretariat of State where some 300 persons are employed. Accompanied by the Assessor, Monsignor Paolo Borgia, he visited and blessed the offices of the Third Section, which was set up in November for the diplomatic personnel of the Holy See. The Holy Father then personally greeted all the officials and employees, wishing them for Easter and thanking them for their work. The last time Pope Francis met the officials and staff of the Secretariat was in April 2013.